Katsuragi Japanese aircraft carrier in 1944. Note the exposed AA weapons. The Katsuragi Aircraft Carrier of the Imperial Japanese Navy was the last completed vessel of the formidable and projected modern fleet of carriers designed by the staff of the Nihon Kaigun. Out of 16 Unryu-class carriers, based on the previous Hiryu-class, only three (Unryu, Amagi and Katsuragi) were completed. As her sisters, Amagi and Unryu, she never embarked her complement of aircraft and spent the war in Japanese waters and her air group 601 was committed to the battle of Iwo Jima. Special attention was dedicated to her Anti-Aircraft defense ( see also photo in 1944). The Katsuragi main armament consisted of a dozen 40-caliber 12.7 cm Type 89 anti-aircraft (AA) guns in twin mounts. The units were positioned to allow them some measure of cross-deck fire. Katsuragi was also equipped with 22 triple 25 mm Type 96 and thirty single Type 96 AA gun mounts, most on sponsons along the sides of the hull. In addition, these guns were assisted by six 28-round AA rocket launchers.Latest technologies were progressively incorporated to the Unryu-class carriers. For example, before the end of the war, a Type 2, Mark 2, Model 4 surface fire-control radar was installed. In addition, a Type 14 early warning radar, ordinarily land-based, was mounted for trials aboard ship. 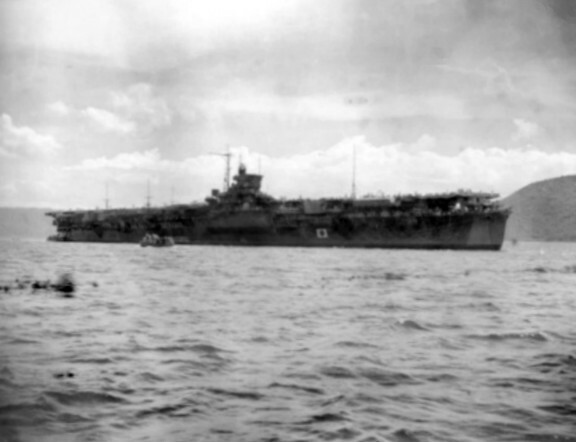 Katsuragi carrier performing transporting mission of Japanese soldiers betwen Solomon islands and Japan in 1946. Note the Hinomaru symbol on hull side. Katsuragi carrier missions after World War II. Katsuragi‘s keel was laid down by the Kure Naval Arsenal in Kure, Hiroshima, on 8 December 1942. She was launched on 19 January 1944 and completed on 15 October 1944. Because of the lack of trained air group crews, and also because of the proximity of American carrier based task forces as well as land-based air wings, the Katsuragi carrier was quickly adopted a defensive role and transferred among a number of ports on the Inland Sea until she arrived in Kure on 15 February 1945. Then, heavy camouflage operations were conducted including green olive color for painting in striking patterns, similar to those of Amagi and Unryu carriers. For example, her flight deck was disguised with fake trees, houses and roads; however, her anti-aircraft batteries remained fully manned. In spite of these efforts she was found and bombed at least two times by American Task Force based aircrafts. However, the damage were not critical and Katsuragi carrier survived the war. Interestingly, after war ended, the Katsuragi missions abroad increased. The Katsuragi carrier was designated as a Special Transfer Ship on 2 October and then assigned to repatriation duty on 13 October after the necessary repairs were made. From Solomon islands, more than 5,000 Japanese soldiers were transported back to Japan. Several trips were taken place mainly between Philippines and Japan. The Katsuragi crew was very limited and consisted only of 12 officers, one warrant officer, and 40 petty officers and crewmen, with Captain Miyazaki still in command. Once these transport and evacuation operations she was appointed for scrapping which started on 22 December 1946 at the Hitachi Zosen facility in Osaka-Sakurajima. The scrapping process was completed on 30 November 1947, more than two years after the end of the World War II. This is an Aoshima 1/700 scale assembly and painting required plastic model kit of the World War II era Japanese aircraft carrier Katsuragi, a Unryu-class aircraft carrier of the Imperial Japanese Navy. Model kit features: 1/700 scale Waterline Series assembly kit. Various flight deck aircraft included. Realistic onboard weapons and accessories. Illustrated instruction sheet and decals included.